Can you imagine a life without pets? Our pets bring us so much joy and enrichment. Life wouldn't be quite the same without them. Although pets quickly become cherished members of the family, they aren't people and don't always behave or the react the same way your human family members do. Examining these common pet myths can help you better understand your furry friends. Zoonotic diseases are transmitted between people and animals. Rabies is the most well-known zoonotic disease, but it's not the only one. Others include cat scratch disease, salmonellosis, roundworm, hookworm, ringworm and toxoplasmosis. You can reduce your risk of contracting a disease from your pet by washing your hands after you pet him or her or handle urine or feces. Do you kiss your pet? Although the habit may help you feel closer to your furry friend, it may sicken you. Your dog or cat's mouth contains bacteria that can make you ill. Although you're much more likely to become ill if you have a weak immune system, it's a good idea to save your kisses for your human family members. Pets don't place the same value on your possessions as you do. When they're bored, they may tear apart the couch cushion, knock over plants or get into other types of trouble. 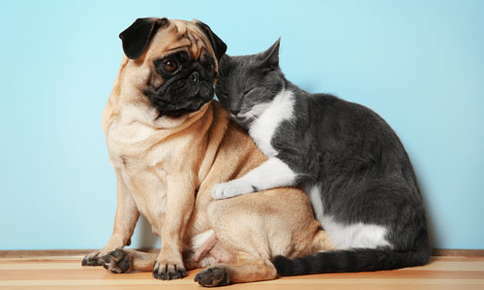 Behaviors we consider "bad" also tend to occur if pets feel anxious or have separation anxiety. Although your pet may cower if you begin yelling, that doesn't mean that he or she understands why you're upset or realizes that it has anything to do with the cushion he or she destroyed hours ago. Yelling at your pet serves no purpose if you don't catch your dog or cat in the act. If you do spot your pet about to tip over your favorite plant or dig into the garbage, a sharp "no" is all that's needed. Although a long, loud lecture may make you feel better, it won't have any effect on your pet's future behavior. If your dog tends to get into trouble while you're away, confine him or her to one room or to a crate. Keep in mind that crates shouldn't be used all day long. Keep anything your pet finds too hard to resist out of reach to prevent mishaps. While it would be nice if cats really did have nine lives, they can become sick or injured just as easily as any other pet. The belief that cats always land on their feet after falls isn't true either. Cats have a natural righting reflex that allows them to re-position their bodies in mid-air. Unfortunately, if they fall from fairly low heights they don't have enough time to right themselves and can experience serious injuries. In 1984, veterinarians at The Animal Medical Center in New York City studied the phenomenon. They discovered that cats that fell from higher distances had the best chances for survival. Pet's aren't immune from tooth decay. Tooth loss can affect your pet's ability to chew and may even lead to nutritional deficiencies. If your pet develops a bacterial infection due to severe tooth decay, the infection may even spread to the heart or brain. Brushing your pets' teeth with gauze or special brushes that fit over your finger can help reduce tooth decay. It's usually easier to start brushing when your pet is young, although older pets can adjust to teeth cleaning with plenty of patience. If your pet absolutely won't cooperate, don't force the issue. Although teeth cleaning is beneficial, it's not worth the risk of an injury to yourself or your pet. Just like people, pets need regular medical care to stay healthy. In addition to detecting health problems, such as diabetes and kidney failure, regular veterinary visits help ensure that your pet receives vaccinations that prevent common diseases, such as rabies, distemper, bordetella, parvovirus, adenovirus, feline leukemia and canine influenza. Veterinarians can also offer helpful advice on behavioral issues and provide suggestions that will help your overweight pet lose weight. Protect your pet's health by scheduling a veterinary examination at least once per year. Call us today to make your pet's appointment. *Available for Emergency and After-Hours Service Monday through Saturday. BAER Testing By Appointment Only. Evening and Weekend testing available.